Don’t Ski Alone; Ski Alta - Ski. Play. Live. If you hate skiing alone, you can’t be shy. I had the ultimate dilemma today. None of my friends could come out to play. It was a Tuesday; a work day for most and forecasters had called Wednesday the day to catch the Powder Flu; not today. Yet the 7 a.m. SkiUtah report touted 16 inches of new snow. The Cottonwood Canyon resorts finally reached over an 100″ base. You see, I couldn’t miss a day like today just because I didn’t have anyone to ski with. Often I lack motivation so if no one wants to ski, I stay home. But not on a serious powder day. Alta it was. The reason I chose Alta and the reason I choose that resort every time I ski alone is because I’m alone for about one run. As I pulled into the Rustler Lodge parking lot my anticipation for fresh tracks was growing along with the size of my bladder. I desperately needed a bathroom. It’s easy to make a pit stop without irritating your friends when you start your day by yourself. Soon, I was riding the Collins lift and looking around for other singles. One woman was heading in to chef at the Collins Grill. Another guy had one run before he too had to get back to work. 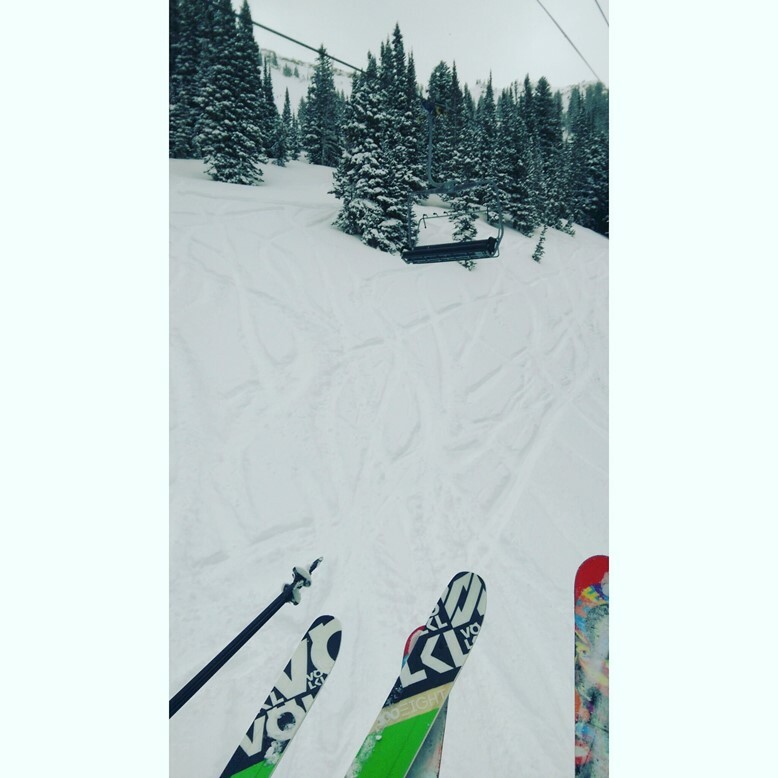 No takers from the first chair ride so it was time to ski. I knew it would be great in Eagle’s Nest. Halfway down, there they were three ladies whooping it up and charging hard. Turns out their fearless leader -Susan Hagen- is a part-time instructor at Alta and the other two gals used to work up on the mountain in the old Watson Shelter. It was now or never. We were all panting and praising the 900 vertical we had just chewed up, with another 900 or so to come, below us. I said, “Hey, can I join you?” Only at Alta is the answer “yes” 100 percent of the time. There’s something unique about this classic big mountain area located in the rear of Little Cottonwood Canyon. It holds the soul of skiers past and present – you never really feel alone in the first place. No other place in the Wasatch feels this communal. 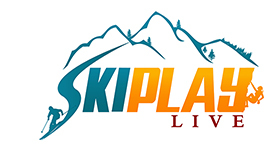 Singles skiing at other resorts seem to have an agenda and they are not to be bothered. At Alta, they’re happy to share their turns with strangers. For the next two hours, we followed Susan through Regal Chute (twice), Eagle’s Nest, North Rustler and finally a hike up to the High Notch. The fresh snow was bottomless in most areas. It was tracked out quickly but still pillowy and forgiving. I made five runs, 8800 vertical, in two hours- including the hike. The peer factor. 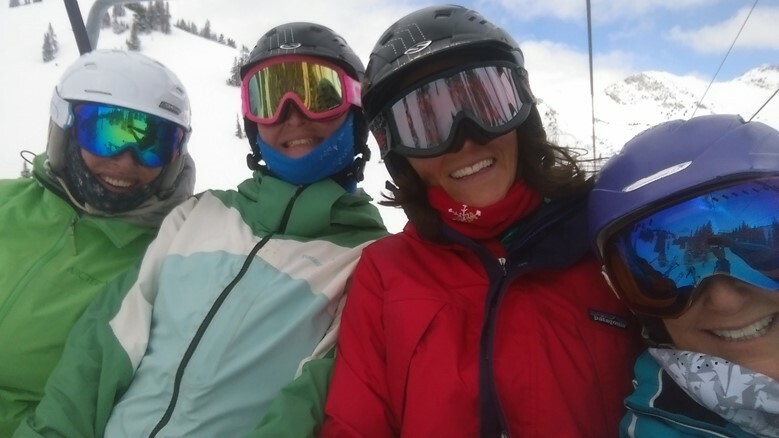 These ladies made me ski harder than I would if I was skiing with Ryan and definitely harder than if I was alone. Had that been the case I probably would have meandered down two runs and called it. This morning was filled with spirit, laughter, smiles, burning thighs and deep breaths as we carved up the deep spring powder that was both untracked and soft crud. At noon my new posse headed in. I waved goodbye but not before I got everyone’s last name and said I’d find them on Facebook. I wondered if they’ll be back on the hill tomorrow. If not I’ll just have to go back to Alta to make more ski buddies. Great article! Fun to meet you! We will have to do some more skiing soon! Memorable day! Bring on the storms, there’s a lot of winter left.